I hated this upside down planet. The planet’s infrared light was beating down, no up, on my face as I walked along the ceiling-ground looking for my group, wondering how the blood wasn’t rushing into my head. I thirsted for water, for rain. A tree appeared in the distance. As I dragged myself closer, I saw it was a willow, with its dense branches improbably reaching up to the ground above me. I crawled under, no above, its branches and rested in the cool twilight. I awoke with a start. Zebras were staring down at me. They weren’t wearing overcoats. Here, Zebras don’t wear overcoats in the rain I remembered. I leapt up, scattering the Zebras, and ran through the branches into the cool rainy relief. failed big time. Try again, said the Oxford Short Course tutor. So I did, and this time I passed the review. Of course, I corrected my answer back in October. It’s just taken me this long to post the correction here. One of my favourite memories of winter was when the snow first fell and Santa Claus came to town. So we’re driving along the Alaska Highway in the middle of nowhere, literally. Not the usual definition of nowhere, where there’s still a town just down the road or a shack that-a-way. No, this is nowhere. No other cars for long periods of time, no shacks, no people, no nothing. And then all of a sudden we see a small yellow helicopter sitting on the side of the road on the cutest little rustic helipad. Behind it sits a hut, announcing helicopter tours. Normand pulls in. Margaret is all for it too. I eyeball that tiny thing on that tiny pad and think, uh, no! We troop into the hut, regardless, where the pilot is having a party of one. Haines Junction had been a veritable festival of human activity compared to this aloneness. He is happy to see us. The two talk turkey with this young guy, and I remain silent, thinking the cost will get them to calm down. But nope. So I decide to pipe up, ask practical questions like how many hours has he flown. I don’t know how I knew, but back then I was familiar enough with what “experienced” meant that his answer didn’t make me any happier. He is a newbie. Gulp. I look outside. Quiet. Not a car, a person, nothing. What would happen if that thing fell down? What if he flew into the side of a mountain? Who would save us? How would they find us? Pock, pock, PAAWWWKKK, is the answer I get from my travel-mates, who treat the wilderness as if it’s a ravine in Toronto. Sigh. The front has a bubble floor, the pilot enthusiastically says to seal the deal. Fantastic! those two exclaim. Me, with my fear of heights, am practically catatonic. But I agree to go, as long as I sit in back. Normand can sit up front. Margaret wants to sit with me anyway. We climb in, strap in, put these mammoth green headphones on, and the rotors start. I’d been in planes quite often. Mostly jets; props a couple of times. But they had not prepared me for the eggbeater. We vibrate, our ears assailed with the most tremendous sound of engines flaring up. Slowly, oh so slowly we lift off that helipad. I make the mistake of looking out, like a dog at a car window. My fear of heights hits me full force. The chopper seems to climb slower than a glacier, than frozen molasses, than, oh hell, I’m terrified. But I can’t stop looking out, like the height was mesmerizing me. Margaret has her camera out and wants to take my picture. I turn and oblige. We take pictures of each other, while I studiously ignore the too-close ground and listen to the pilot talking through the headphones. We approach the St. Elias Mountain Range in Kluane National Park and Reserve. The helicopter is not climbing fast enough, I’m convinced. We are so going to hit that straight-up rock wall on the highway edge of the Range. This was it! Whoosh we’re over. Wow! I can see a bit of spectacular scenery through the front window and turn to look out the window on my right. The mountain side is pretty close, but after paying gobs of money, I do not want to miss this! So I remember a trick I learnt on how to forget heights: stick the camera in front of my face. I do that. And begin composing and clicking. I want to finish the colour film and use the black and white, the one with fine grain I’d gotten especially for grand scenery. And now the ground is far below, and my fear of heights vanishes. I and Normand exclaim over the scenery, and I start asking Margaret did you see that, did you see that, like you do. Not getting much of an answer, I turn to look at her. She’s looking back at me, at the back of the seats, at the floor, anything but out her window. Um, why aren’t you looking out, I ask her? Didn’t she see those Dall Sheep way up high, and how about that ribbon of glacier down below? No, she replies. She’s a bit air sick. Better to not look out. I feel bad for her; her first time up and she gets air sick! She disabuses me of my fantasy. She gets air sick always. I stare at her. Uh, why did you want to come up? Gravol usually works, but she’d forgotten it or didn’t have it on her or something. Now, I’m really puzzled! Why’d she want to come up so badly?! The adventure! What adventure?! You’re sick!! And you’re not even looking at those young mountains!!! Suddenly, I have visions of her throwing up in my lap. No throwing up, she assures me. Better not. And I turn back to the mountains and glacier and happily snap away while Normand does the same up front. The pilot gives both me and Normand a chance to look for and shoot Mount Logan in the far distance. It’s very hard to see through the haze, and it boggles my mind that any sane human being would hike in starting from close to my position and then climb that thing! The pilot turns the copter this way and that to give us different views of Mount Vulcan (or Vulcan Mountain) as well as the Kaskawulsh glacier as we chopper along its length. Barely any time has passed when the pilot announces he is turning back. Already?! We’re vibrating up a storm, I wonder if my teeth are still in my head, I certainly feel scrambled enough, but I want to stay and shoot some more. Well, I am almost out of film anyway. We head back to that mountain on the highway edge of the St. Elias Mountain Range, the ground rises up, the sheep become starkly clear, and I put my camera back up to my eyes before my fear pounds my heart right out of my chest. We are over, we are heading back, we are touching down, the rotors are off, and I wonder if I can hear anymore. The car seems very quiet after that trip. Poor Margaret continues to feel air sick in the car, at the visitors lot we stop at — some cars by themselves, only one person from Hamilton, Ontario with his little bells who quickly vanishes — along the trail we hike with Mr. or Mrs. Grizzly bear behind, up the little hill we climb, and then back down to the car and back to Whitehorse, where she gets some Gravol. I’m glad they pock, pocked, PAAWWWKED me into going into the helicopter — and truth be told I really wanted to see what was on the other side of those highway-edge mountains — but I shall never do it again! Remembrance Day on YouTube Page. I was looking through my old, very old, files to see if there’s anything worthwhile to republish on my website, and I came across a rant I wrote on the Toronto Public Library. I don’t remember writing on the TPL — I only remember writing on cocoa butter, to be honest — and I barely remember this issue I had with our beloved library. But it was interesting. Before two drivers decided to alter my life, I was a regular at the local library. I tried to restrict my borrowings because (1) people were always complaining I was reading too much, (2) if I borrowed too often in one week I’d lose track of which book was due when, and (3) most importantly, if I read at my preferred rate I’d run out of books to borrow from my local library as, ahem, I had a habit of doing. I wasn’t too keen on going farther afield because farther afield was getting farther and farther. And I didn’t reread books pre-injury because as soon as I read the first paragraph, the entire book would come back into my head as if I’d just read it at Warp speed. So why bother? Anyway, as I was saying, I found my rant on the TPL and decided to check out its website to see if anything had changed. I clicked on the big arrow at the top of its main page pointing to website redesign. That might be interesting, I thought, and besides it caught my eye amongst all that text. And so it was. 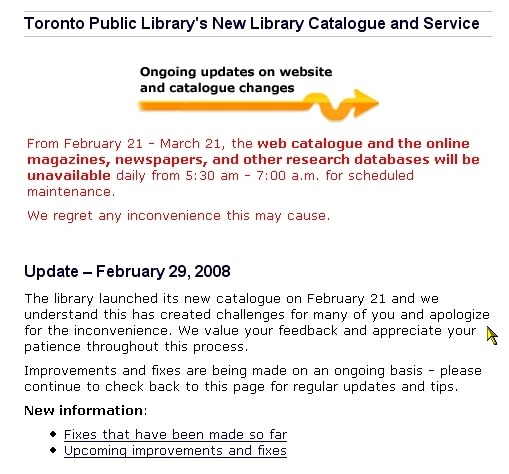 Apparently, library users are being challenged by the brand-new catalogue system. (Click on screen captures below to see in full, readable size.) I shrugged, not caring too much about what those challenges could be and surfed off to the new catalogue. If it’s new, it must be snazzy, right? And easier to use than a decade ago, right? Um. The catalogue was easy to use. Just type in the author’s name. Hmmm…let’s try Agatha Christie first. I clicked Enter, and presto, it came up with maybe half-a-dozen search results for one library. That was quick. But pretty paltry if you ask me, and I noticed the one I randomly clicked on was on hold. A paperback on hold? That’s pretty bad. I backed up to the search page and tried Rohinton Mistry. Ahhh, now I know what those challenges are. Absolutely hysterical if one was like me and just surfing for the heck of it. But if I was really looking for Mistry’s book, I’d be tearing my hair out in frustration. I did try twice, thinking I must have done my usual mini-not-noticing-what-I-was-doing thing and clicked on the wrong item and it not sinking in right away that any search result with Mistry in it should not pull up the page I was sent to. Nope, I had clicked on the one I thought I had, but the TPL’s computer is clearly one confused puppy. The kicker though, the really, truly weird part about this search result, the one that has me shaking my head in wow-isn’t-the-universe-strange, is that it brought up an anthology that was edited by my editor. And if it’s not him, it’s a guy with the same name and birth year! And so it seems that some things don’t change in almost a decade of being out of touch with library doings. The TPL continues to use computer systems and methods that are as challenging as ever to the poor user (and they also can no longer spell, having misspelled the title of Mistry’s book). It’s a good thing I hadn’t tried to enter its portal only eight years post-head-injury. Maybe I’ll wait awhile longer, maybe a few years longer, before I attempt to pit my brain against its computer. Oh, and about that article I wrote in the 1990s, I’ll publish it in my next post, just for humour’s sake.